Bharati Vidyapeeth (Deemed to be University), Pune and Institute of Management and Entepreneurship Development organised an Elocution competition into, on 9th January 2018. This competition is held every year as a symbol of respect to our Hon’ble Saheb, Dr.Patangraoji Kadam whose birthday is on January 8th. The Elocution Competition’s process started from 9 A.M with the registrations and high tea at IMED Entrance and Seminar Hall. After the initial welcome by the anchor, introduction about the competition was given to all the participants by Dr. H.M. Padalikar . 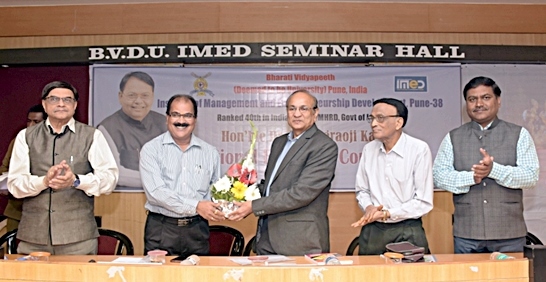 Then Dean of BVU and Director of IMED, Pune Dr. Sachin Vernekar welcomed everyone and delivered a motivational speech. He wished luck to all the contestants. This was followed by felicitated of our chief guest Vice chancellor Prof. Dr. Manikraoji Salunkhe Sir and the judges for the competition. Later on inaugural speech was given by the Vice Chancellor which was followed by the Vote of Thanks by Dr. Pramod Pawar. And then all the participants were lead to their respective venues and the competition started. The competition was open to all the students above 12th standard and undergraduates from the recognised institutes of India. Participants had a choice between English, Marathi, and Hindi as a language of expression. The speech limit was seven minutes and a warning bell was given after five minutes. The participants were restricted from reading any part of speech from any paper or any other medium whatsoever. · Dr. Patangraoji Kadam and his Mission ‘Social Transformation Through Dynamic Education ‘. · Role of Youth in building New India. There was in total five different venues and sixty nine participants took part from whose fourteen participants were selected for the final round.